Lesbians Who TechSheryl Sandberg, Facebook COO, spoke at Lesbians Who Tech in San Francisco on Friday. Sheryl Sandberg spoke with Recode cofounder Kara Swisher at Lesbians Who Tech on Friday. They discussed gender in the workplace and how powerful corporations like Facebook can create more equal and diverse workforces. She says that much has changed since she wrote “Lean In” in 2013. Sandberg even gave a word of advice to male managers struggling with how to act in a post-#MeToo workplace: Don’t treat female employees differently than male employees, no matter what. Sandberg says that she worries that after #MeToo, there could be ‘unintended consequences’ where men are afraid to mentor their female employees. Facebook chief operating officer Sheryl Sandberg says that in the wake of #MeToo it’s not enough to stamp out sexual harassment – it’s time to build a more equal workplace. Sandberg was speaking with Kara Swisher, cofounder of Recode, on stage at Lesbians Who Tech, a San Francisco-based professional conference for queer women and allies. As the national conversation shifts to proper work ettiquette – can co-workers hug or drink together? – Sandberg said she has heard men express that they don’t always feel comfortable having one-on-one time with their female subordinates. But this, Sandberg warns, could have dire consequences for women’s equality, especially if male subordinates are still getting access to both “informal and formal mentoring time,” such as after-work socialising and business trips. So, she says, give that access to male and female employees equally – or don’t give it at all. “If you’re not comfortable having dinner with women, do not have dinner with men,” Sandberg said. Sandberg elaborated that she envisions a world of total workplace equality, beyond just a stop to sexual harasment. 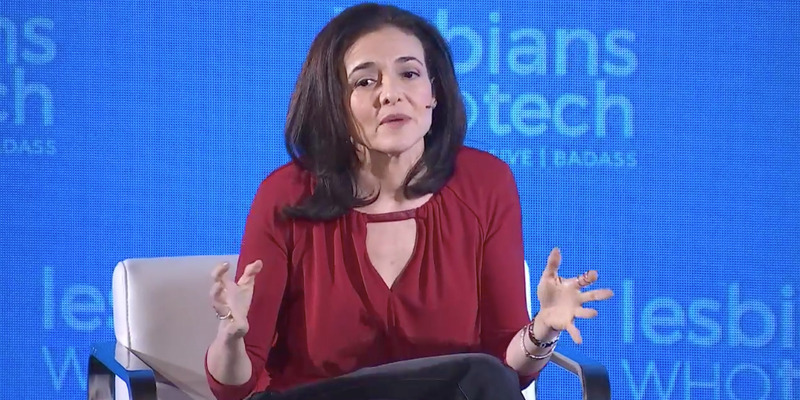 Sandberg said that a lot has changed since the release of her 2013 book “Lean In,” which urged women to work harder and put in more hours to get ahead in the workplace. “There’s lots of things I got wrong,” she said. In particular, she said she is worried about “the potential unintended consequences” of #MeToo and the attention being paid to sexual harassment at work. Sandberg said she fears that male managers will shy away from mentoring female employees if sexual harassment scandals are front of mind. Ultimately, Sandberg said she believes gender equality needs to be led through policy change – a big pivot from her “Lean In” hypothesis that women can get ahead by adapting their behaviour and participating more at work.